Hard Work and a Good Deal traces the history of the Civilian Conservation Corps, which supplied jobs to more than 77,000 Minnesotans during the Great Depression. 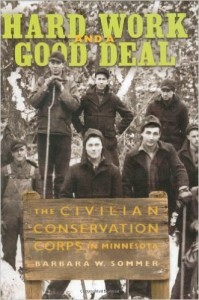 Nearly one hundred interviews contribute to oral historian Barbara W. Sommer’s lively narrative as the “boys” look back on their time in the CCC, during which many of them became men. African American enrollees tell of the segregated policies enforced in the army-run camps; workers for the CCC-Indian Division remember reservation projects that included rebuilding a fur trade-era stockade at Grand Portage. Together, these men give voice to early efforts that advanced the conservation of Minnesota’s natural resources five decades in a few short years.